Royal ROY RSP 5 H Heavy Weight Aluminum Sauce Pan 5 Qt. TigerChef > Smallwares > Cookware > Aluminum Cookware >< Aluminum Sauce Pans > Royal ROY RSP 5 H Heavy Weight Aluminum Sauce Pan 5 Qt. $3.09 Royal ROY RSP 5 HL Heavy Duty Aluminum Sauce Pan Cover 5 Qt. $30.20 Vollrath 67308 Wear-Ever Natural Finish Tapered Sauce Pan with TriVent Chrome Plated Handle and Helper Handle 8.5 Qt. $22.03 Vollrath 67305 Wear-Ever Natural Finish Tapered Sauce Pan with TriVent Chrome Plated Handle 5.5 Qt. $15.89 Vollrath 67302 Wear-Ever Natural Finish Tapered Sauce Pan with TriVent Chrome Plated Handle 2.75 Qt. $12.63 Vollrath 67301 Wear-Ever Natural Finish Tapered Sauce Pan with TriVent Chrome Plated Handle 1.5 Qt. $35.50 Vollrath 68308 Wear-Ever Natural Finish Tapered Sauce Pan with TriVent Silicone Handle and Helper Handle 8.5 Qt. $15.70 Vollrath 68301 Wear-Ever Natural Finish Tapered Sauce Pan with TriVent Silicone Handle 1.5 Qt. $20.69 Vollrath 68303 Wear-Ever Natural Finish Tapered Sauce Pan with TriVent Silicone Handle 3.75 Qt. $22.67 Vollrath 68304 Wear-Ever Natural Finish Tapered Sauce Pan with TriVent Silicone Handle 4.5 Qt. $24.41 Vollrath 68305 Wear-Ever Natural Finish Tapered Sauce Pan with TriVent Silicone Handle 5.5 Qt. $13.03 Winco ASP-5 Aluminum Sauce Pan 5 Qt. $17.72 Vollrath 67303 Wear-Ever Natural Finish Tapered Sauce Pan with TriVent Chrome Plated Handle 3.75 Qt. 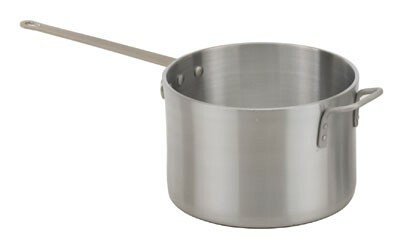 $20.55 Vollrath 67304 Wear-Ever Natural Finish Tapered Sauce Pan with TriVent Chrome Plated Handle 4.5 Qt. $17.72 Vollrath 68302 Wear-Ever Natural Finish Tapered Sauce Pan with TriVent Silicone Handle 2.75 Qt. $22.57 Vollrath 69301 Wear-Ever Tapered Sauce Pan with SteelCoat x3 Non-Stick Interior and TriVent Silicone Handle 1.5 Qt. $25.50 Vollrath 69302 Wear-Ever Tapered Sauce Pan with SteelCoat x3 Non-Stick Interior and TriVent Silicone Handle 2.75 Qt. Reduce sauces, cook vegetables and more with the functional and economical Royal ROY RSP 5 H Heavy Weight Aluminum Sauce Pan 5 Qt. Great for restaurants, hotels and other food service facilities, this NSF certified sauce pan is exceptionally durable to withstand high volume use. Made from heavy weight aluminum, this sauce pan is non-corrosive and offers excellent heat conduction. Thanks to its helper handle, this sauce pan provides a secure and comfortable grip for hassle free transport.